• Will Brinson of CBSSports.com has some more fun with Tebow numbers. • Tebow earned $250,000 for the victory based on an incentive written into his contract. Since he took 70 percent of the team's snaps this season, he is entitled to a quarter-million dollars for every Broncos playoff victory. • Twitter announced that 9,420 tweets per second were sent immediately after Tebow's overtime TD pass. That set a new sports record for the social media site. • Wondering why James Brown, Dan Marino, Bill Cowher (! ), Shannon Sharpe and Boomer Esiason took an elbow during the CBS postgame show? The television ratings for Broncos-Steelers could provide a clue: The game pulled in a whopping 25.9 rating for CBS, becoming the highest-rated AFC wild-card game since 1988. (That was 24 years ago, pre-Internet and before a majority of Americans had cable or satellite.) Variety estimates 45 million people watched Tebow's touchdown pass in overtime. My inbox had about 10 messages reading pretty much the same. • Lady Gaga was watching Tebow's heroics as well. She sent the following tweet to her 17 million followers after the game. Cindy Boren of The Washington Post collected some other notable celebrity tweets. • It's only a matter of time before Tim Tebow birthers start up a crusade. 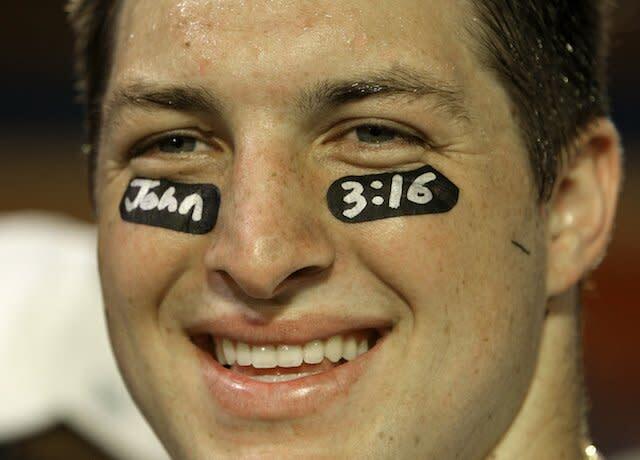 • Did you see Tim Tebow's mean face Sunday? SB Nation did and advises "not to get the Tebow angry." • Tebow was the first NFL player to complete four passes of 30+ yards in a single quarter of an NFL playoff game. • ESPN's QBR rating says Tebow's second quarter was the third-best single quarter from a QB in the NFL since 2008.